ORLANDO, Fla., Feb. 2 /PRNewswire/ -- The Renault-Nissan Alliance today announced that Nissan is entering into an agreement with the City of Orlando and the Orlando Utilities Commission (OUC) to advance zero-emission mobility in the Orlando area by promoting the development of an electric-vehicle charging network and policies to support widespread adoptions of electric cars. The announcement, made at the Orlando stop of the Nissan LEAF Zero Emissions Tour, helps pave the way for the 2010 introduction of Nissan LEAF, the industry's first all-electric, zero-emission car designed for the mass market. "The Renault-Nissan Alliance has committed to becoming a global leader in zero emissions," said Carlos Tavares, Chairman, Nissan Americas. "Nissan and the City of Orlando share the vision that zero-emissions mobility is the ultimate solution for addressing questions of climate change and energy independence. We are looking forward to bringing the Nissan LEAF, the only mass-marketed, all-electric zero-emission car, to Orlando." As part of the agreement, Nissan and the City of Orlando, along with OUC, will develop plans to promote a charging infrastructure for electric cars that encourages home and workplace charging, as well as a public charging infrastructure. The partners will work to coordinate the establishment of policies and help streamline charging infrastructure deployment. Nissan also has agreed to make available a supply of electric vehicles to the City of Orlando and in and around the metropolitan area and Orange County, Fla. The City of Orlando has a goal to foster electrification as part of its Green Works Orlando Initiative. "This partnership is a continuation of the City of Orlando's commitment to cleaner, more sustainable transportation options – building on the recent approval of the commuter rail and high-speed rail funding, plans to expand the downtown bus system, expanded bicycle infrastructure throughout the city and converting the city fleet to more efficient models," said Orlando Mayor Buddy Dyer. OUC has been working towards helping Central Florida become plug-in ready, and recently installed two charging stations in downtown Orlando, one of which is solar powered. OUC has committed to the purchase of up to 10 Nissan LEAF units to be used in its fleet for service calls and educational purposes. "OUC is dedicated to embracing fuel efficient technology like the Nissan LEAF and helping develop the infrastructure necessary to support it," said Byron Knibbs, OUC Vice President of Sustainable Services. "We are proud to be part of this community-wide effort to stay ahead of the curve." Nissan, along with alliance partner Renault, is the only automaker committed to making all-electric vehicles available to the mass market on a global scale. Nissan LEAF, a five-passenger all-electric car, will be available for private and fleet customers. It is being launched in the U.S., Japan and Europe in late 2010. Nissan has spearheaded a holistic approach to zero-emission mobility by working with states, municipalities, utility companies and other partners, to prepare markets and infrastructure. Nissan has formed more than a dozen partnerships in the United States, in areas including State of Tennessee, the State of Oregon, Sonoma County, San Diego and San Francisco in California, Phoenix and Tucson, Ariz., Washington D.C., Seattle, with Progress Energy in Raleigh, N.C., and with Houston-based Reliant Energy. Nissan also is working with AeroVironment for the supply and installation of home charging stations, creating a one-stop shop for the Nissan LEAF and its charging equipment. Through the 24-city Nissan LEAF Zero-Emission Tour, which stopped in Orlando today, Nissan has been showcasing the electric vehicle and battery technology as well as the company's zero-emission mobility objectives. In North America, Nissan's operations include automotive design, engineering, consumer and corporate financing, sales and marketing, distribution and manufacturing. Nissan is dedicated to improving the environment under the Nissan Green Program 2010, whose key priorities are reducing CO2 emissions, cutting other emissions and increasing recycling. 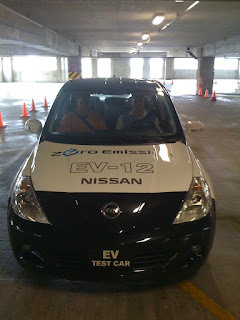 More information on the Nissan LEAF and zero-emission mobility can be found at www.nissanusa.com/leaf-electric-car. The Renault-Nissan Alliance has begun zero-emission vehicle initiatives in Kanagawa Prefecture and Yokohama in Japan, as well as in Mexico, Israel, Denmark, Portugal, Monaco, the UK, France, Switzerland, Ireland, China and Hong Kong. The Renault-Nissan Alliance, founded in 1999, sold 6,090,304 vehicles in 2008. The objective of the Alliance is to rank among the world's top three vehicle manufacturers in terms of quality, technology and profitability. I've been researching on the internet just for a high quality read relevant to this specific field . Searching in Search engines I lastly came across this website. Seeing this post So i'm happy to state that I have a wonderful uncanny feeling I discovered exactly what I was ready for. Most definitely i'll ensure to don't forget this site and check it out constantly.